in the Philippines during the Marcos Years. Delicious Thai food, interesting topic, great company … ! Limited guests only. Respond immediately. 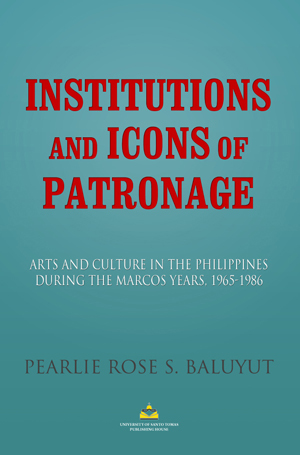 Pearlie Rose S. Baluyut is the author of Institutions and Icons of Patronage: Arts and Culture in the Philippines during the Marcos Years, 1965-1986. Based on primary documents and interviews, Pearlie Baluyut’s book seeks to understand the politics and aesthetics of Ferdinand and Imelda Marcos’ rule through the Cultural Center of the Philippines, the Philippine High School for the Arts, and the National Museum of the Philippines. Rather than interpret the Marcoses’ support only as political propaganda, Baluyut construes their rhetoric and gestures as a spectacular performance as patrons and icons, engendering both defiance and reverence among their constituents. 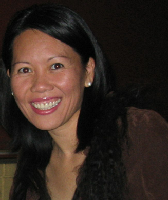 The author received her B.A., M.A., and Ph.D. in Art History at UCLA. She has taught art history, theory, and criticism at the Institute of American Universities in Aix-en-Provence, France, and other colleges and universities in the United States, including the California State University, San Bernardino, from 2006 to 2011 as Assistant Professor of Art. In June, she will be teaching at the University of Santo Tomas’ Cultural Heritage Studies Program and conducting research on the oldest cabinet of curiosities-turned-museum in the Philippines as a Fulbright Scholar. The event is part of the ongoing community outreach program organized by Philippine Expressions Bookshop. Please join us .. hear, meet and greet the author. And have a book autographed for your private library. 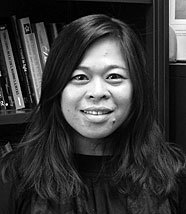 Author Celine Parreñas Shimizu will be the featured lecturer at 1pm on Sat., May 12 at the LA Asian Pacific Film Festival and she will sign her latest book, Straightjacket Sexualities: Unbinding Asian American Manhoods in the Movies (Stanford University Press) after the lecture. Directors Guild of America – 7920 W Sunset Blvd., LA 90048 (310) 289-2000. Also showing at the venue at 5:00pm is Give Up Tomorrow, a 95-minute documentary film which was co-produced by Marty Syjuco. His brother, Miguel Syjuco wrote the much-acclaimed novel, Ilustrado. This documentary film is a piercing case study of political and judicial corruption involving some of the most politically prominent and powerful families in the Philippines. Despite credible evidence pointing to Paco’s innocence, and numerous inconsistencies during the trial and subsequent appeals, he was nevertheless convicted of the crime and sentenced to death by lethal injection. Viewers will sympathize with Paco’s family, who desperately try every legal avenue for appeal to overturn Paco’s conviction amid the constant melodrama and media circus surrounding his case. Amnesty International, the government of Spain, Fair Trials International and the United Nations have all advocated for Paco’s innocence and release. He continues to be jailed to this day. Director Michael Collins and Philippine-born producer Marty Syjuco have crafted a riveting tale on a young man’s struggle to maintain his innocence. Welcome to the blog of the bookshop dedicated to Filipino-Americans in search of their roots.